Kanchanbagh (P.O. ), Hydearabad, India-500 058. The paper reviews the status of film radiography in the realm of modern industrial radiographic inspection techniques. Modern techniques have been developed to meet the requirements of non-destructive evaluation of critical and intricately cast components. Still, the film radiography retains its persisting demand and importance in the industries for quality control/ quality evaluation of the critical components, i.e. aerospace components. The paper also highlights the general principles of radiography and the crucial factors affecting film radiography. The industrial radiography came into being with the discoveries of X-rays and ¡-rays by W.C. Roentgen and Becquerel, respectively in 1895 and 1896 . Only two months later in 1896, Campbell Swinton in London showed flaws in metals and C F H Muller in Hamburg made the first commercial X-ray tube. Since then many people, in other countries also, started working on the development of X-ray tube for industrial radiography. During World War II (1939 onwards), around 3000 X-ray sets were in use in Germany alone. Although, the work on photographic film for use with X-rays was carried out from 1900 to 1918 by Eastman Kodak and others, the special industrial radiographic films reached the market only around 1940 . Van der Graaff developed electrostatic generator X-ray machine in the early 1950. 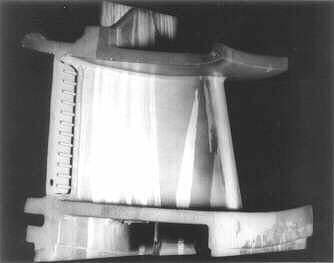 Although, Henri Becquerel took a gamma-radiograph of an aluminium medal (using uranium salts) and Mme Curie took one of her purses (using radium), the first report of industrial radiography with ¡ -rays was in 1925 by Pilon and Laborde, of a damaged turbine casting . Eventually, artificial radioisotopes (Tantalum) Ta-182, Co-60, Ir-192, (Ytterbium) Yb-169, (Selenium) Se-75, etc. appeared for use in industrial radiography. Radiography and ultrasonic testing are the two common methods used for non-destructive evaluation (NDE) of an object for its internal soundness. Both the processes have certain advantages / disadvantages over one another. Ultrasonic testing is a safe, fast and economical method. But, in cases of intricate castings where ultrasonic testing technique fails to detect the internal flaws due to problems associated with probe-contact and job configuration, radiography can be employed with innovative approaches. Due to production of permanent image of the flaw/ defect on a recording medium (film) which can be preserved for future references, the conventional film radiography has been in great demand. The quality of a radiograph is affected by the type and strength of the source of energy, film speed, source-film distance etc. The subject contrast of a radiograph depends up on the component shape & size, grain size and grain orientations. The problems of unsharpness, graininess and contrast are the fundamental parameters of flaw sensitivity which raise lot of controversies and misconceptions . Curved, cylindrical, flat and other conventional shapes of an object do not pose serious problem to the conventional film radiography. But, intricate castings of shapes like that of an aero-engine components require innovative approaches for successful examination by the conventional film radiography. Keeping pace with time and technology development, R&D on radiography developed a few modern radiographic techniques. In "Real Time Radiography", the object under inspection can be manipulated with intended orientations and the flaw-images can be analysed on the screens, as desired. In a still more advanced technique, the cross-sectional areas of interest can be scanned for defect analysis. In this method of inspection the overlying and underlying structures do not obscure the area of interest (under scanning), even though the job is manipulated during examination. This process is called "Industrial Computed Tomography" or, industrial CT scan. In both the cases, the very fine defects are not resolved on the TV screen to the extent of film radiography. This is the reason why most of the aerospace specifications rely more on the use of conventional film radiography. The present paper is based on the innovations  used in film radiography of investment cast Ni-base superalloy aero-engine components with equiaxed grains. The paper further discusses the issues associated with directionally solidified investment cast components. Interpretation of results in such a case is highly confusing due to presence of some sorts of ghost images/ patterns. Radiography works on the principle of absorption of the penetrating radiation (X-ray/ ¡ -ray or particulate) by the intervening material. The differential absorption due to variation in density (or, due to presence of flaws and defects in the material) produces latent images on the radiographic film. Like ordinary light the radiation energy also affects the photographic film. It sensitises the silver halide coating on the film. The differential absorption/ transmission of the energy through the material differentially affects the halides in emulsion on the film. The exposed films are developed and fixed in two different solutions at a suitable temperature followed by drying of the films. On processing, these latent images are converted into permanent impressions on the radiographic films. These films are called the radiographs and are ready for evaluation/ interpretation. Brightness/ darkness of the impressions on the film is called image contrast. Image contrast is a function of penetrating energy, time of exposure and film development. The sensitivity is the measure of the resolution of the image which can be obtained on a radiograph. The sensitivity is affected by exposure parameters (voltage, amperage, time and source-film distance), subject sharpness/ unsharpness, image contrast/ film density, film quality and processing technique. Various types of penetrameters (wire, strip or hole type) [1, 3] are available for sensitivity measurement for different materials, as per different specifications. Figures 1 & 2 show two different types of Ni-base super alloy investment cast components, a rotor and a stator, respectively. There is a thickness variation from leading (thicker) edge to the trailing (thinner) edge and also from the root to the free end of the aerofoils of the rotors. Moreover, the aerofoils appear to have twists and change in orientation both, from leading edge to the trailing edge and from root to the free end. The stators have aerofoils with thickness and orientation variations from leading edge to the trailing edge of the aerofoils. But, there is no twist from one end to the other. Fig 1: Showing a Rotor with the aerofoils. Fig 2: Aerofoils between shrouds of a Stator. Non destructive evaluation (NDE) of the these components is not possible by contact/ immersion ultrasonic methods. The only suitable NDE method for these components is radiography. The specification recommends the use of film radiography. The limitations of "Real Time Radiography" and "Industrial CT Scan" methods have already been mentioned in the introduction part of the paper. As a matter of principle, during film radiography also, the condition of film-object contact/ distance is not fully met for both the castings. In the case of rotor, the trailing and leading edge exposures were standardised by placing the casting up side down, for optimum results. But the stator aerofoils had to be exposed only from the top because, in upside down position the aerofoils go too far from the film which lie at the bottom of the casting. The straight portion of the aerofoils as viewed in Fig.3 is exposed with higher KV-energy for optimum penetration through this thickness of the intervening material in the X-ray path. Different from the rotor, the stator's aerofoils do not have free ends and the outer as well as middle shrouds create lot of problems in sampling the junction of the aerofoils with the two adjoining shrouds. Innovative approach with angle exposures were made to solve this problem. But, the two shrouds still obscure the angle of interest, to some extent. Fig 3: Showing schematic of an aerofoil with straight portion of the leading edge. Fig 4: Showing an aerofoil with shrouds and rims at both ends in a DS Vane. In case of some of the rotors graininess patterns have been observed on the radiographs. The grain patterns have then been examined and confirmed by etching the components. Otherwise, the castings were free from internal defects. Film radiography of a directionally solidified (DS) investment cast small hollow vane component, as shown in Fig. 4, has also been a challenging job. Three different exposures for the concave/ convex aerofoil were designed for different thicknesses. But, the exposures for shrouds and rims could be standardised with utmost difficulty, at 45°from the vertical axis. Interpretation/ evaluation of these radiographs also need lot of expertise and patience. Ghost patterns and cat tails sometimes appeared on the radiographs and created lot of confusion. Re-radiography of the cut sections of the rims and metallographic investigations exposures of the cut/ sectioned rims confirmed that these defect like indications were just dubious. Moreover, such spurious indications were not found in another similar vane with equiaxed grains. Hence, it is believed that such ghost/ cat tail patterns in the directionally solidified component might have been caused by X-ray diffraction  from the elongated grains. During standardisation of radiographic exposures the major issues to be taken care of are proper penetration, desired/ achievable sensitivity, sufficient density and contrast. All these aspects are based on the film-type and the correct exposure parameters involving radiation output, source-film-distance and the film-processing technique. Many aspects of film radiography have been reviewed in the light of above radiographic inspection and innovative experiments. Apart from the film-type, source-film distance (SFD) and film processing technique, there are certain other crucial aspects which affect the film radiography. The first one is the design of the X-ray tube in respect of the focal spot (port) size. In the case of the above mentioned rotor and stator aerofoils, with the fixed exposure parameters, better resolution/ sensitivity has been observed in exposures with 1mm x 1mm focal spot (using new Philips 450 KV X-ray unit) than in exposures with 2mm x 2mm focal spot (Andrex 300 KV old unit). This observation might be well related to the quality of X-ray, a second factor, produced by the two different equipments. The X-ray production in the new machine (450 KV) is discontinuous type and ripple-free due to the high frequency generators which are absent in the case of 300 KV old machine. A combination of high energy output and smaller focal spot give better combination of penetration, sensitivity, latitude and definition of the image . The third factor is the quantum of X-ray energy produced. It varies with focal spot size, the window material and the condition of the target material. Quantum of energy increases with increase in the size of focal spot. Beryllium being the lightest metal (with least absorption of energy) for the purpose, serves as the best window material for filtration of X-rays. The target material gets eroded with time/ use and hence the quantum of energy produced diminishes slowly. the quality/quantum of X-ray energy. Evaluation of the radiographs with respect to defect identification and interpretation is critical in the sense whether the defect indications are real or spurious with ghost/ cat-tail patterns due to X-ray diffraction patterns. The authors are grateful to the Director, DMRL for his kind permission to present & publish this paper in the 15th WCNDT, Rome, Italy. Also, the authors express sincere thanks to the colleagues for their support and advises. R. P. Singh, E. Madhava Rao, Trilok Singh and J. P. Mishra, Proceedings of the 14th World Conference on NDT, New Delhi, India, 1996, pp 1951-1954. ASM Metals Handbook, Volume 17, Ninth Edition, 1989, pp 338-340. ASM Metals Handbook, Volume 17, Ninth Edition, 1989,pp 345. Lecture Notes in Industrial Radiography and Safety Aspects, 2nd Nov. - 2nd. Dec. 1981, Defence Laboratory, Jodhpur and Bhabha Atomic Research Centre, Trombay, India.